When visiting the Garden Route one passes through many beautiful areas without actually stopping to explore. This is such a pity as one normally misses a lot by just driving past. Last week we visited the Garden Route and as we were staying in Mossel Bay took some time to visit the Great Brak River village. 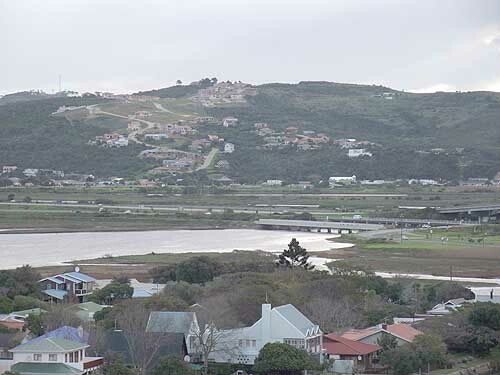 The Great Brak River village nestles in a perfect setting between some hills midway between George and Mossel Bay and as one drives over the crest of a hill on the N2 highway to George the Great Brak valley opens up in front of you. If one could stop for a photo you would have a perfect postcard photo for your album. To add to the scenic beauty of the valley the Great Brak River meanders through the valley and under the N2 highway on its way to the sea. 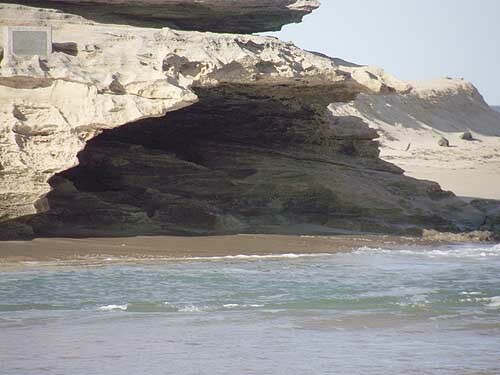 At the mouth of the river is a lagoon and normally the mouth of the lagoon is closed to the sea. In the mouth of the lagoon is a beautiful island named “Die Eiland” and its only access to the mainland is a very narrow bridge. (One car at a time only) The island although pretty small is inhabited and has many timber framed houses built on it .In summer when the river is not flowing the water levels drop in the lagoon the island is surrounded by beautiful golden beaches which make the island a place to visit for swimming, sun tanning and enjoying a day out on the beach. Unfortunately this week when we visited the area it was pretty wet and rainy and the inhabitants of the island and Great Brak village were still busy cleaning up after the flood that hit the area earlier in June. 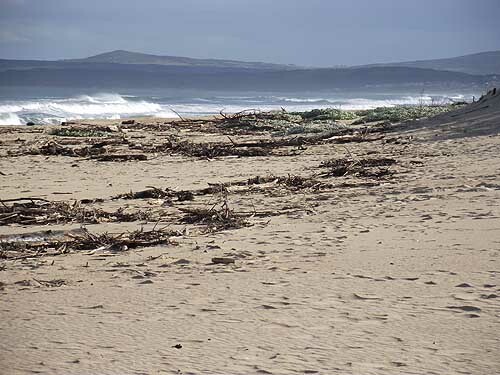 The beaches were not as pristine as they normally are as the river has come down in flood and deposited all sorts of debris on the beach. Over the past few years the South Coast has been experiencing a devastating drought and in early June the heavens opened and dropped so much water that all the rivers along the coast became raging torrents. The Great Brak river is normally very slow flowing and has a dam in its upper reaches where the flow of water to the sea is controlled. Unfortunately so much rain fell in early June that the Wolwedans dam started to overflow and so the sluice gates were opened to release some of the water. Residents in the Great Brak village were however not notified of the water that was being released and woke up the next morning to find the river flowing through their homes and their electricity supply suspended. Fortunately the water levels only increased by about a metre so not too much damage was done in the village. The houses on the Island were also flooded and residents had the added problem that they could not evacuate their homes as they had to cross the narrow bridge leading to roads on the other side of the bridge which were flooded. The reason for all the flooding was that the mouth of the lagoon was closed and the water could not get to the sea. Once the mouth was opened he water levels soon subsided and people could start cleaning up. The village of Great Brak River has an interesting history dominated mainly by Charles Searle and his family. Great Brak River village was founded by Charles Searle an English paper-mill hand who emigrated to South Africa in 1859 with his wife and four children. After a sea voyage of 68 days they landed in Mossel Bay and took up residence in the area. Once settled Charles Searle tendered for the job of Keeper of the Toll Bridge at the Great Brak River and won the tender. 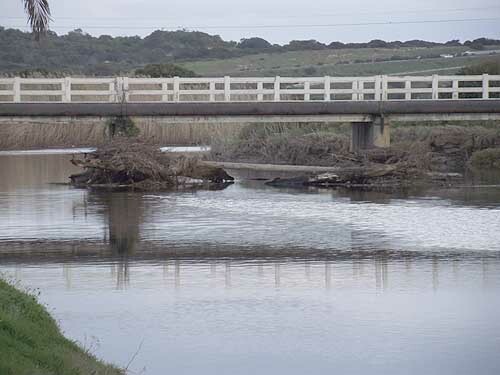 The toll bridge consisted of a Toll house, a small boarding house and a farmhouse on the Mossel Bay side of the river. It appears that Searle was not overly busy tending the toll bridge as he had time to manufacture boots which he sold to travellers who visited the area. Soon he had so many orders that he had to employ a full time boot maker to help him. In 1864 Searle lost the tender as keeper off the toll house and was forced to move out of the toll house farm house. Not wanting to move out of Great Brak village he purchased the land at the rear of the toll house and set up a general dealer shop. In 1865 he once again tendered for the keeper of the toll house job and won the tender. At the same time he became the postmaster of Great Brak river and kept this postion for 34 years using part of his shop for his postal duties. Although Charles Searle passed away many years ago his family still owns and runs a shoe and boot factory in Great Brak River. The family also own a number of shoe and clothing factories in Cape Town today. Over the years from its humble beginnings the Great Brak River village has increased in size and today boasts many modern houses, shops and places to stay. Great Brak is an interesting village to visit as a museum has been established and there are a number of old historical churches to visit. 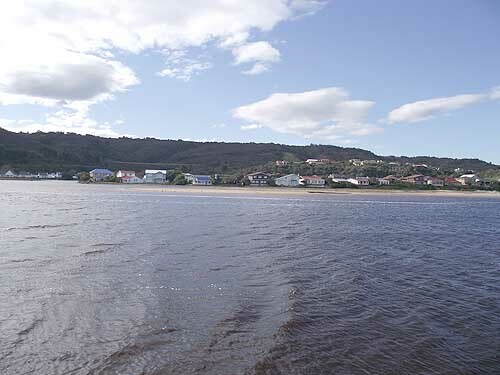 The scenery and the beautiful river are a great attraction as are the pristine golden beaches, the angling and surfing and the Southern Right whales which visit Mossel Bay from May to November. 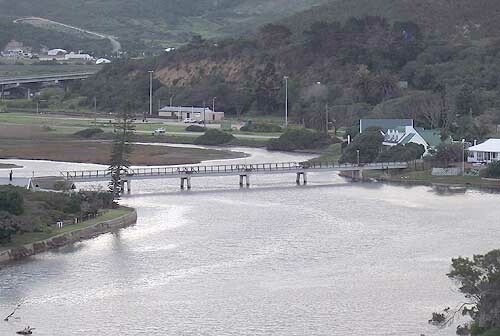 If you have time on your next trip up the Garden Route drop in at Groot Brak River for a visit.